Rio Salado College | RioNews: BestCompaniesAZ Military Career Event March 7! BestCompaniesAZ Military Career Event March 7! Transitioning out of military life? Looking for a new career? Take part in BestCompaniesAZ 4th Annual Military Career Event for veterans and their spouses, March 7 in Phoenix. More than a thousand jobs will be made available through Arizona’s veteran committed employers. The Career Expo will be held from 9 a.m. - 12 p.m., where veterans can meet hiring representatives from more than 40 military-friendly, award-winning employers. 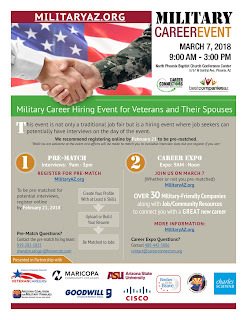 Visit MilitaryAZ.org for the registration link, event details, hiring companies, open positions and on-site resources. The hiring and networking event is open to all military – active, retired, reservists -- as well as their spouses and significant others. Attendees will also have the opportunity to participate in the hiring event that conducts job matching and potential interviews with hiring companies from 9 a.m. – 3 p.m. on the day of the event. Register before the Feb. 21 pre-match deadline!